THE STORY - Beatriz, an immigrant from a poor town in Mexico, has drawn on her innate kindness to build a career as a health practitioner in Los Angeles. She collides with her polar opposite, a self-satisfied billionaire, at a wealthy client's dinner party. THE GOOD - Salma Hayek's soulful and emotional performance. A great mixture of light and dark comedy. THE BAD - The ending gets a tad bit too dark leading one to wonder what the overall message of the movie is. 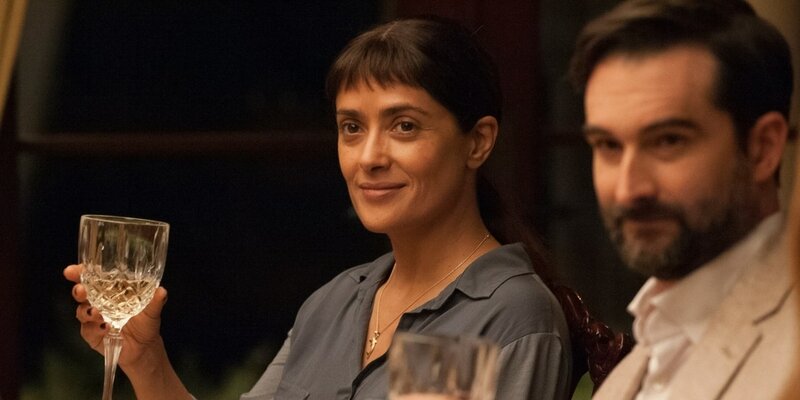 ​"Beatriz At Dinner" starts off well enough with a comical and darkly relevant dinner party that shows the contrast between two totally different walks of life. However, by the end of the film, it gets bogged down by its own seriousness and ends on a note that is ambiguous, which I'm still struggling to find the meaning behind. Salma Hayek gives a wonderful, soulful performance as Beatriz and the rest of the cast is sharp and witty. While Mike White's script certainly has its fair share of zingers, the overall message of this film ends on somewhat of a down note leading to some thought-provoking ideas about how we view others differently than ourselves. Beatriz (Salma Hayek) is a spiritual healer who immigrated from Mexico a few years ago. She has one wealthy client named Cathy (Connie Britton) who she attends to due to her relationship with Cathy's previously terminally ill daughter that she saved. When her car breaks down at Cathy and her husband Grant's (David Warshofsky) house on the evening where the couple is set to have a high-end business dinner, Cathy offers Beatriz the opportunity to stay. At this dinner, Beatriz meets Doug Strutt (John Lithgow), his wife Jenna (Amy Landecker), Alex (Jay Duplass) and his wife Shannon (Chloe Sevigny). Together, the wealthy, entitled and racist group discuss their business dealings and viewpoints on the world as Beatriz listens, until she cannot take it anymore. Salma Hayek, as stated before, is truly remarkable here. It is not a showy performance which will win her any Oscars or anything but she is very empathetic and humanistic as the spiritual healer that recognizes the goodness and simplicity within life. Contrasted against the brash and racist John Lithgow who plays Doug Strutt with a serious case of self-entitlement and what you get is a great clash of ideologies. Imagine "Beatriz At Dinner" as a comedy with manners during the Trump Administration and that pretty much sums up what you need to know about the movie. Both characters express themselves clearly and by the end, we certainly know what kinds of people Beatriz is dealing with. However, it is how writer Mike White and director Miguel Arteta handle the ending of this film that left me feeling cold and confused. Everything leading up to those final few minutes I found was light, smooth and yes, a tremendous amount of fun. There are some awkward moments of humor which had my theater howling with laughter and the more serious moments certainly landed well too. However, as the film draws to a close, it gets progressively darker and just like its own characters, there is a stark contrast between the light and the dark. "Beatriz At Dinner" explores the divide between the wealthy and the poor, the spiritual and the materialistic, the inhumane and the compassionate. The dialogue zips along with wit and stings us in the heart and the mind. Performances are all fun, while Salma Hayek does a lot of the heavy emotional lifting in the face of such arrogance and distastefulness. Watching all of the actors bounce off each other with their ego and racist talk, despite being so close-minded to the idea that this is actually how they are coming off to Beatriz is fascinating and deeply upsetting. However, what is even more upsetting is how this enjoyable film goes off the rails in the final minutes leading to a mixed message that has a lot to say but may not know how to best say it to everyone.